"Do clip hair extensions come in wavy textures?" Clip hair extensions (also called clip-in hair extensions and clip-on hair extensions) come in a variety of wavy, curly and straight textures. The great feature of clip-on hair extensions is that they're probably the easiest hair extensions to attach: no glue, no braids, no fusion, no clamps, no heat; just open the clip, attach the hair extensions and press the clip closed - what could be easier? Well without further ado, let's crack on and look at two popular wave patterns and top tips for maintaining clip-in hair extensions. As you may well know by now if you've read our guides on textures for lace front wigs or textures for micro loop hair extensions, this is the gentlest of all wavy hair textures for hair extensions, wigs and hairpieces. Body wave clip-in hair extensions suit anyone whose hair is either naturally wavy or who uses heat styling tools to create a wavy textures. If you choose human hair clip-in extensions then you can use heat to straighten however excessive heat styling (hairdryers wands, irons or heated rollers) can damage the hair - if you think you'll be changing from wavy to curly very often then it may be better to buy a set of straight clip-in hair extensions to preserve the lifespan of your wavy clip-in extensions. I you choose synthetic clip-in hair extensions, then it's better not to use heat and if they're heat resistant then always use a low heat setting. Don't over comb the clip-in hair extensions as this can cause the hair extensions to shed. Always remove moisture from the actual clips. Avoid using styling products directly on the actual clips as these can cause the coating deteriorate and the metal underneath to become exposed and be subject to corrosion. 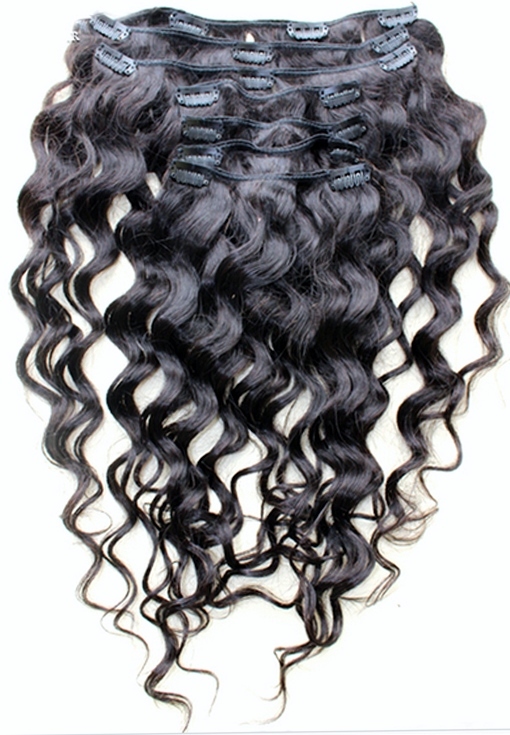 If you like water and you like waves, then you'll love the water wave hair texture - boom! 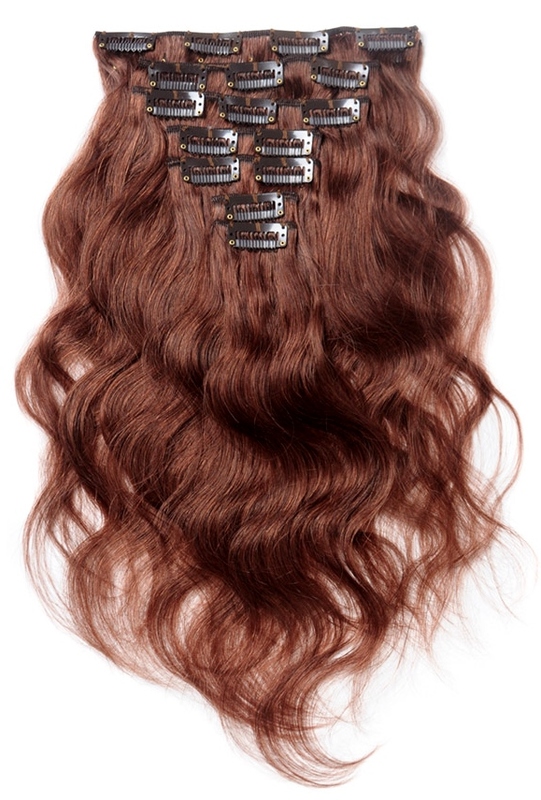 OK, OK, jesting aside, water wave clip in hair extensions are the next step up from the body wave texture. There are curlologists out there that will argue that the S pattern is a type of curl and we're not here to argue with them as we're not hair texture experts. That being said, folks with curly hair, straight hair and wavy hair have all been known to rock the water wave texture whether in wigs or hair extensions (and yes, you guessed right; curlogist is a made-up word). As mentioned before, if you buy human hair clip-in hair extensions you can use heat styling tools, but prolonged overuse of heat styling can damage the hair and distort the wave pattern - so unlike dietary advice, heat little and not very often. If you choose synthetic clip-in hair extensions then check that it's heat resistant before using anything and then test a small discreet area at the lowest setting. Keep the hair moisturised daily with oil free sprays or moisturizers without mineral oils - there are plenty of plant-based oils for hair that are better suited to your clip-in hair extensions. If possible air-dry the clip extensions in an upright position (hanging) so that the wave pattern can fully return as it dries. Righto, that seems to have covered the wavy wonders of clip-in hair extensions. Two wonderfully wavy textures for clip-in hair extensions that are versatile and easy to maintain... and if you'd like to try curls, you can check out our guide for curly clip-on hair extensions.